A detailed history of the battle at Brawner's Farm, which culminated into the Battle of Second Manassas. 5.0 out of 5 starsGreat Little Study of the "Black Hat Brigade"
I purchased this book on the day that I toured the Brawner Farm battlefield. I am also a fan of the Iron Brigade so I thought I would get this book in the hopes that it would be very good. My hope was fulfilled. This book is a wonderful study of the Iron Brigade's stand at the Brawner Farm on the evening of August 28, 1862. This was a very good book in that much of the story is told by the soldiers themselves. i very much like civil war books that quote from soliders that were present at the battle. This book was also very good in demonstrating the effort put forth by the regiments of the Iron Brigade. One of the most fascinating facts is that at the time of the Brawner Farm fight, only the 2nd Wisconsin had been engaged in battle - First Manassas. The other units had not yet been in battle and it was not known how the midwestern boys would fair. However, the 6th Wisconsin, 7th Wisconsin and the 19th Indiana did not disappoint. All these regiments stood, basically with no protection, and slugged it out with the Stonewall Brigage, as well as other Brigades of Jackson's Corp. The stand made by the "Black Hats" should have indicated to General Pope that Jackson's Corp had been located. However, that was not to be and that story is told in great detail in John Hennessey's Book "Return to Bull Run". After this battle, the midwestern boys of the Iron Brigade received another regiment - the 24th Michigan. 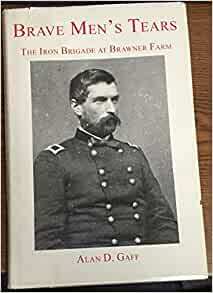 This is a wonderful little study of the how the Iron Bridage fought at Brawner's Farm at the beginning of the Battle of Second Manassas. If you have an interest in the Iron Brigade, this is a must. If you just have a general interest in the civil war, this is a must. I read this book in two days as I could not put it down. If you are from the midwest, the boys in these regiments will make you proud even to this day. As the only all midwestern bridage in the Army, many had their doubts as to the fighting ability of the brigade. However, all those doubts went away with the fighting at Brawner's Farm. 2.0 out of 5 starsMisrepresented. Pictured with a book cover/dust jacket. Came without one. Not nearly as impactful. I would have paid more for one with a dust jacket. I am interested in the Iron Brigade, and found this book very interesting, and well written. I highly recommend this book to anyone interested in the Civil War. In the introduction Alan Nolan, author of The Iron Brigade, says we need to understand the little picture and by assembling little pictures, we come to understand the big picture. This well written, very readable study of Brawner Farm is an excellent example of what the little picture should be. In August 1862, a Federal division stumbles onto Stonewall Jackson's command outside of Manassas, starting of what became the Second Battle of Manassas, one of the worst Federal defeats in the East. Jackson attacks King's Division marching past his lines in a classic ambush. King unable to command leaves his division to fight as brigades. This they did fighting Jackson to a stand still. For a couple of hours, with little movement, the men stand in formation and fight it out. When night ends the battle, both sides have suffered badly with neither gaining any real advantage. King loses the battle by withdrawing which allows Longstreet to join with Jackson. Pope misread the situation and botches the larger battle. This is a detailed history of those few hours. The brigades of John Gibbon and Abner Doubleday fight the famed Stonewall Brigade, Ewell's Division and other elements of Jackson's Corps receiving and inflicting heavy causalities. With an excellent narration and well-placed maps, we are never lost and understand the battle. This is Gibbon's Brigade first battle; they excel and in time are named The Iron Brigade. Doubleday is no slouch, his actions are crucial in stabilizing the line early in the battle and his brigade performs well. This is a detailed tactical study of the battle, with a good analysis of the events leading up to it. King's errors and the reasons for them give us a glimpse into the real world of Civil War command and control lacking in many books. This is not blue and gray squares being moved over flat maps. Senior officers blunder about in the dark, orders are lost, officers become fixed on a small area of the field and the grand havoc of battle reigns. I cannot recommend this book to highly! It is one of the best small battle books I have read and will increase your understanding of brigade combat.